January 19, 2011 - Boeing announced on Tuesday that it expects delivery of the first 787 Dreamliner in the third quarter of this year. The new delivery date reflects the impact of an in-flight incident during testing last November and includes the time required to produce, install and test updated software and new electrical power distribution panels in the flight test and production airplanes. During approach to Laredo, Texas, Boeing?s 787 Dreamliner ZA002 while on a test flight, lost primary electrical power as a result of an onboard electrical fire. Backup systems, including the deployment of the Ram Air Turbine (RAT), functioned and allowed the crew to complete a safe landing. The Boeing 787 Dreamliner is a long range, mid-sized, wide-body, twin-engine jet airliner developed by Boeing Commercial Airplanes. It seats 210 to 330 passengers, depending on the variant. Boeing states that it is the company's most fuel-efficient airliner and the world's first major airliner to use composite materials for most of its construction. 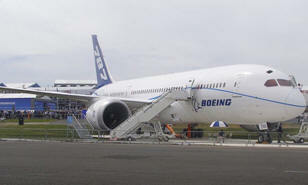 The 787 will consume 20% less fuel than the similarly-sized Boeing 767. Some of its distinguishing features include a four-panel windshield, noise-reducing chevrons on its engine nacelles, and a smoother contour regarding its nose. "This revised timeline for first delivery accommodates the work we believe remains to be done to complete testing and certification of the 787," said Scott Fancher, vice president and general manager of the 787 program. "We've also restored some margin in the schedule to allow for any additional time that may be needed to complete certification activities," Fancher said. The 787 program has been gradually returning individual airplanes to the flight test program. After receiving interim software and hardware improvements, four flight test airplanes have been subjected to extensive ground testing and a thorough review to ensure their readiness to return to flight. The remaining two airplanes will be returning to flight in the days ahead to bring the full flight test fleet back up to flight status. The revised first delivery date is not expected to have a material impact on 2010 financial results. Financial guidance and anticipated initial 787 deliveries for 2011 will be discussed in the company's earnings call on January 26. The 787 development and production has involved a large-scale collaboration with numerous suppliers around the globe. It is being assembled at the Boeing Everett Factory in Everett, Washington. Aircraft will also be assembled at a new factory in North Charleston, South Carolina. Both sites will deliver 787s to airline customers. Originally planned to enter service in May 2008, the project has suffered from repeated delays and is now more than three years behind schedule. The airliner's maiden flight took place on December 15, 2009, and it is currently undergoing flight testing with a goal of receiving certification in mid-2011 and entering service in Q3 2011. The aircraft's initial designation 7E7 was changed to 787 in January 2005. The first 787 was unveiled in a roll-out ceremony on July 8, 2007, at Boeing's Everett assembly factory, by which time it had become the fastest-selling wide-body airliner in history with 677 orders. By September 2010, 847 Boeing 787s had been ordered by 56 customers. As of 2010, launch customer All Nippon Airways has the largest number of 787s on order.